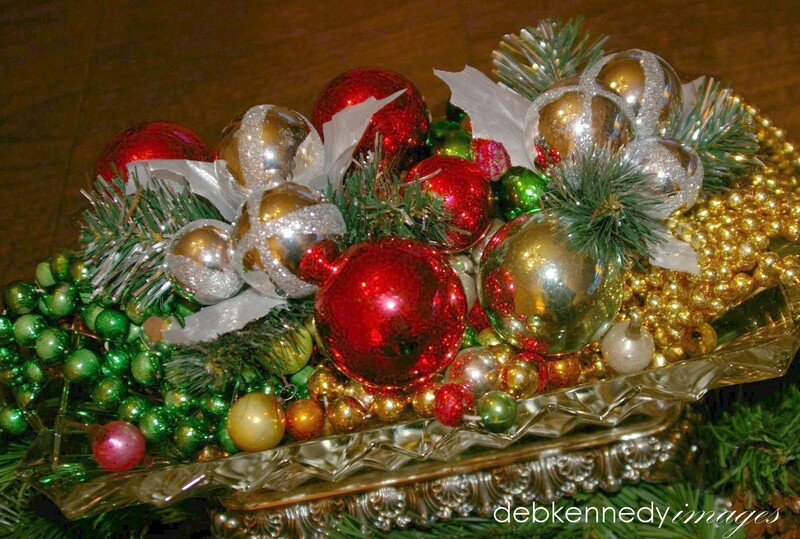 I asked if you collect and use vintage & antique ornaments in your Christmas decor. 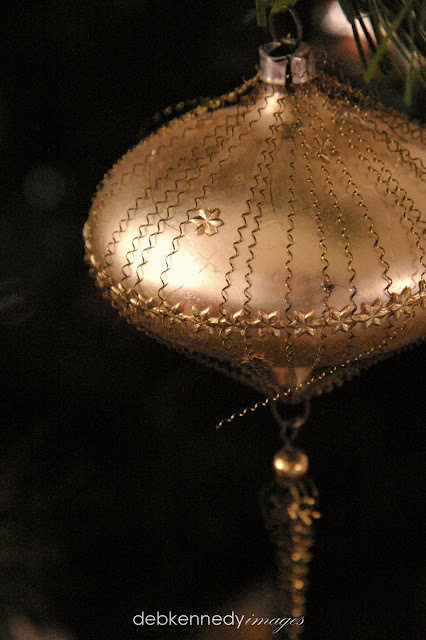 Fran's impressive Christmas ornament collection dates from the late 1800's. 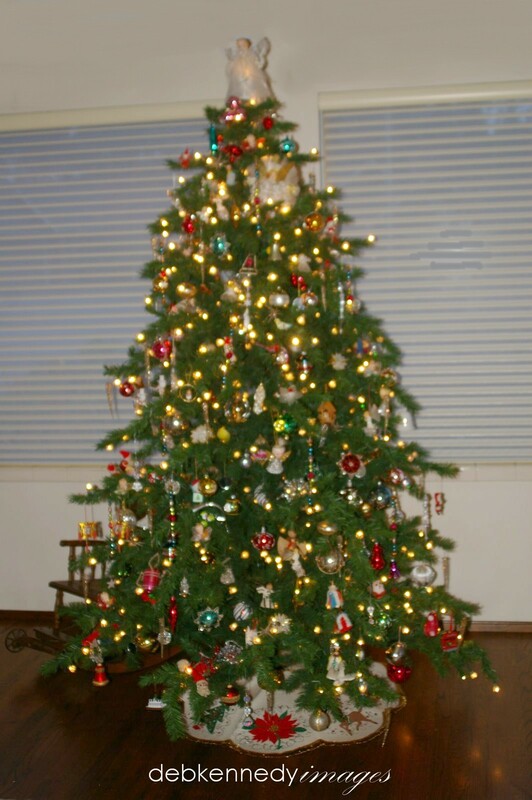 Some ornaments came from her grandmother, then her mother added to the collection, then Fran added her own - three generations of Holiday memories. Each precious fragile bauble is lovingly swathed in pristine white tissue and laid gently in original boxes. Packed into plastic tubs, they are safely stored all year - until the lucky day that I get to go to her house and help her unearth them. As each box is opened and each little wad of tissue unwrapped, Fran's eyes dance and her smile grows wider. Occasionally I see a tear in her eye, as a memory catches her breath. I hear every story...'These we got on our honeymoon in Spain...' , 'This Dresden angel was mom's', or 'My niece made this for me when she was 7' (she's 40 now). Precious memories of happy times, all brought out into the light each Holiday season. It took hours of work, but it was truly a labor of love - for Fran, and for me. She started out as a client and is now a dear friend. We love our time together to chat, visit, catch up, and share Holiday memories. And after the hours of chatter and gasps and the occasional 'Oh Dear!' when one of the oldest ornaments is found to have deteriorated beyond repair (SO sad), all of the special ornaments end up on the tree - and somehow manage to look more beautiful every year! It's not a 'designer' tree, not a theme tree...it's a tree of life. Fran's life. Her life as a child, as a daughter, as a wife, as an aunt. It's her story, beautifully told. I heap them into her collection of silver hotel serving pieces, and they look absolutely perfect. In decorating as in life, the lack of perfection is often what is most charming. And damaged doesn't mean something isn't still useful. Many years ago, she called me to ask if I could help her "bring the Christmas Spirit back" into her home, after her mother died. Which was two years after her husband died. That same year, she lost her brother. Too much for one person, I think. This woman has known so much in life...growing up the daughter of an immigrant farmer, to create a career in broadcasting and hotel management, to her wonderful, loving marriage to a successful businessman who adored her, then figuring out life as a single woman on her own for the first time in her life. Joy, sorrow, love, loss, pain and passion have touched her, and yet she is vibrant in spirit, young at heart, and a gracious, caring person. I am in awe of what she has experienced, what she has learned, and how she easily admits that she really still has so much to learn. She impresses me. I respect her, I admire her, and I love her dearly. How do you respond to that, except with tears and a hug?! I treasure this woman, and am so blessed to have her in my life. We share stories, laughter, lots of tea, and lunch. And Love is the Christmas Spirit that she brings to me. Now that I no longer live in Seattle, I will miss decorating for her, but our friendship is still shared across the miles by phone calls. Before I left Washington, I created a photo album of all of the photos you see above, which are of her own ornament collection, and gave it to her when I took her to tea at the Four Seasons Olympic Hotel in Seattle. That was where I delivered the sad news that I was leaving Seattle...and the happy news that our time together has been so meaningful to me. With these photos, she can enjoy her beautiful Christmas ornament collection and her memories any day of the year... and so can I. What an amazing gift... what you have given to her, as well as what she has given to you. Thanks for sharing, Deb. I just love the spirit of Christmas. It can be shared all year long. Thank you for sharing this with us. It reminded me that we do not have to spend lots of money to make someone happy. Such a heartwarming story. Very touching and well written. Thank you for sharing.